Isaac Newton’s Gravity is an addictive physics puzzle game that’s based around—you guessed it—gravity. It has 50 unique levels of contraption building, each of which are challenging enough that you won’t be putting this game down anytime soon. Namco's puzzler features physics that are pretty much perfect—so perfect that you’ll often find yourself frustrated at how placing an item too far to one side can cause your creation to tumble. It also features whimsical, mad-scientist-like graphics and soothing music. Each level begins with a ball that drops from a starting location and rolls whichever way the course takes it—until it hits an obstacle or loses momentum. 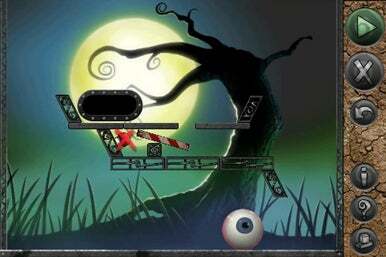 The object of the game is to use various items (different items are provided in each level) to give the ball a clear path to the level-ending button. The ball doesn’t always have to hit the button—you can also use other objects to hit the button, so long as the button is pushed. The limited number of items in each level and the complexity of the courses requires quite a bit of creativity on the part of the user. For each level you beat, two are opened—so if you get frustrated with one, you can always go to the next. Of course, at any given time you can only play two unbeaten levels, so the game isn’t too easy. The only real issue I had with the game—other than its somewhat frustrating addictiveness—was control. The game is sometimes too effective at its accuracy in portraying physics—sometimes items have to be placed very precisely or they will fall over (especially when you are stacking things). Watching your careful stack of items tumble to the ground is, to say the least, annoying. Also, objects can get stuck in various parts of the obstacle course when you are moving them around—another thing that will frustrate you and sometimes ruin your carefully designed contraption. Overall, the game is addictive but frustrating, and requires some serious precision and control. You do receive a certain number of points for hints, which you can use if you get completely stuck. There’s also a level editor, which is a great idea but limited (you can’t share your levels with friends, and, well, who wants to play their own level?). The game is certainly well-designed, though, and definitely worth the $2.99.